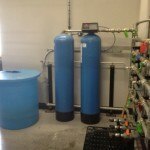 No matter whether you are in the residential, commercial or industrial sector, AKVO can design, supply and install fully automatic water softening units that are right for your application. You can rely on our knowledge and experience to develop water softeners that comply with legislation, improve your processes and are economical. Incorrectly sized water softeners can cause more problems with your system, in terms of water flow volume, pressure and lime scale build-up. AKVO offer water softener plants to treat any water flow rate; from a few litres to many tonnes, and offer a free softener sizing service. On-site consultation, where an engineering tests and reports on your softener’s performance. Strip, lubrication, service and re-assembly of the unit to ensure its continued reliability and efficiency. Written reports with performance data, itemised points of work completed, and recommendations for optimising your softener performance and efficiency. Call 0844 244 8726 or email office@akvo.co.uk to arrange a free consultation and quote.